Timing is everything. I read in El País that they are presently staging "Kathie and the Hippopotamos" in Madrid. In my books-to-read bookcase, I came across this trilogy of plays. This collection was directed and translated by David Graham-Young in 1989 at the Gate Theater in Notting Hill, England.Being a big fan of Vargas Llosa, these plays deliver the witty, intelligent and wide range of story telling. Each play has a forward explaining his views and thoughts which help to set up the action. "The Young Lady from Tacna" has that historical story of a 100-year old woman being written by her young grand nephew. The historical flavour adds to the mood but the outcome is typical Vargas Llosa....with a good twist. "Kathie and the Hippopotamos" is a brilliant play on reality. The actors interchange several family members which makes it very challenging but creates a highly-charged farce. "La Chunga" is the Vargas Llosa I am familiar with: smoky bar, the seedy characters including a mysterious woman owner of the bar. Moreinteresting, it includes a character called Lituma, who first appears in "Quién mató a Palomino Molero" also written in the same year, 1986, then again in "Lituma en los Andes" and his latest book, "El hero discreto". The play setting works and can be easily visualized.I loved these plays. 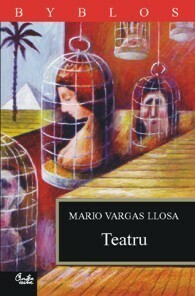 Vargas Llosa takes full advantage of the play setting and sadly, would love to see any of them staged. Almost makes me want to fly to Madrid!